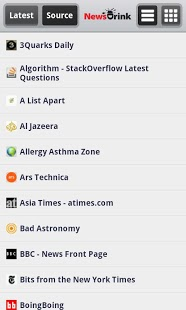 Note: the NewsDrink Android app lets you read your newsfeed when you login. 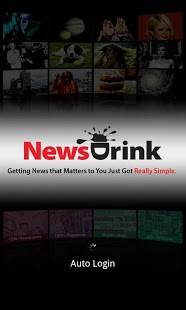 To create an account or add/delete news sources, you must visit NewsDrink.com (invite code: rockstar). NewsDrink is iTunes for the news – the easiest way to find, add and read *your* favorite news! Find your favorite publications, discover new ones, read all your news in a single feed on your Android device or anywhere else! 25,000+ PUBLICATIONS on 2000+ TOPICS. NewsDrink has one of the world’s largest collections of free, instantly accessible publications including 2000+ newspapers, 1500+ magazines, and 25,000+ blogs categorized into 2000 topics from knitting to foreign affairs to celebrity news to manga to the Los Angeles Lakers. NewsDrink is the easiest way to discover and read the world’s leading publications – and it’s FREE and will always be FREE! Love the Pittsburgh Steelers? In less than a minute, browse & subscribe to Steelers’ coverage by the Post-Gazette newspaper, the Steelers.com site, Fox Sports, CBS Sports, Yahoo Sports, ProFootballWeekly & 30 top Steelers blogs. Are you a bibliophile? Browse and subscribe to book reviews from the NYTimes, the LATimes, the WSJ, the New Yorker, the New York Review of Books, Literary Kicks, Head Butler, and dozens of other leading newspapers, magazines and blogs. Those are just 2 examples…visit NewsDrink.com to create your free account and browse leading news sources on 2000+ topics! COUNTRIES SUPPORTED: We currently have publications from the US, UK, Australia, South Africa, India, New Zealand, Italy, France, Spain & Germany with more coming! SOCIAL. See What Your Friends Are Reading. At NewsDrink.com, connect your account with Facebook, Twitter or E-mail to see what publications your friends are reading. Share Articles You Love on Twitter, Facebook, Email, Delicious or read them later via Instapaper or ReadItLater. GOOGLE READER SUPPORT. 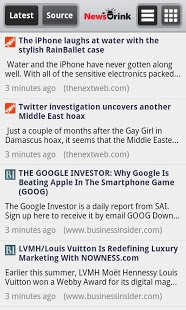 You can also import your feeds from Google Reader. VIEWS. Read all your news in an all-in-one newsfeed or by source in either a grid or list view. Leading newspapers like the LA Times, Washington Post, USA Today, Wall Street Journal (WSJ), the New York Post, the Oregonian, Chicago Tribune, Denver Post, NewsDay, Chicago Sun-Times, Star Tribune, San Jose Mercury News, the Boston Globe (boston.com), the Philadelphia Inquirer (philly.com), the Seattle Times, Kansas City Star, the India Times (TOI – Times of India), Hindustan Times, the Hindu, the Guardian, the Independent, the Daily Telegraph, the Sun, the Daily Star, the Daily Express, the Globe and Mail, Montreal Daily News, Vancouver Sun, the Financial Post, the National Post, the Australian, Investor’s Business Daily (IBD), & 1000s more! Leading blogs like Gawker, PerezHilton, Lifehacker, TechCrunch, Mashable, ReadWriteWeb, Kotaku, Engadget, Gizmodo, Huffington Post, GigaOm, PaidContent, BoingBoing, Neatorama, VentureBeat, Mac Rumors, Daring Fireball, TMZ, the Daily Beast, Jezebel, Mediaite, Think Progress, Hot Air, Daily KOS, Michelle Malkin, Gothamist, PhysOrg, Joystiq, DeadSpin, Smashing Magazine, Web Design Trends, & 1000s more! Leading magazines like Wired, Technology Review, Time, Newsweek, Sports Illustrated, the Atlantic, Foreign Policy, MacLeans, GQ, Maxim, AdBusters, Men’s Health, Bodybuilding, Complex, Rolling Stone, Spin, People, OK, Film Comment, Entertainment Weekly, Vogue, Elle, Marie Claire, Femina, Self, Oprah, Mental Floss, New York, Reader’s Digest, The Week, the Nation, National Review, Reason, the New Republic, Art Forum, Art & Architecture, the New Statesman, the Guardian Weekly, Mojo, NME, Car & Driver, India Outlook, India Today, New York Review of Books & many more! Leading websites like the BBC, Reuters, Al Jazeera, CNN, Yahoo! News, ESPN, NDTV, CNET, ZDNet, Slashdot, NPR, TED, CNN-IBN, In.com, CBC, Moneycontrol, CNBC, Martha Stewart, Delicious, Reddit, Digg, AOL News, ABC News, Buzzfeed & many more!